There used to be a time when foliage was used simply to fill in the gaps! But these days foliage is far more than just a filler. Much of it is beautifully rich looking and can look absolutely spectacular just by itself in a simple arrangement. The majority on the market is generally varying shades of green – although some varieties such a leucadendhron or cornus are beautiful reds, oranges and yellows. The use of bare twigs and branches are also becoming increasingly popular – willow placed simply in a tall glass vase can look stunning on its own. But whenever using foliage you must always keep in mind the shape of the flowers you are using, the design you’re after and the effect you are after. Do you want tall and linear or small and compact? Do you want movement in your design or for it to be more structured? These are things that you must always ask yourself because certain types of foliage will not go with certain types of design. Medium and small designs work well with ivy, ruscus, choisya, euonymous and hebe, while larger arrangements dictate longer stemmed or wider foliage such as laurel, fatsia leaves; large ferns or cornus. Whatever your design if you always keep in mind the three Fs you can’t go wrong with your use of foliage. Arrange your foliage, add the filler then highlight with the focal flowers. Grasses – bear, steel etc. 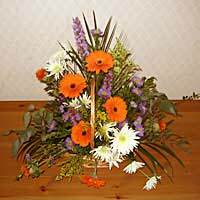 Beautifully linear and suitable for all sorts of arrangements. You can leave it to “float” or loop it. Eucalyptus – an old favourite with florists. Wonderfully scented. Some eucalyptus is sturdy with rigid silvery green leaves, while others are far softer with dark green leaves. Hypericum – these berries are perfect for adding a touch of colour to a design. There are several varieties with berries ranging for orange to a beautiful burnt brown red. Also known as St John’s Wort! Leucadendron – comes in red, yellow and bronze. The red variety is sometimes known as sunset safari. Tall foliage with sturdy stem. Pittosporuim – very popular and can generally be found in most gardens. The green and yellow leaves are small with crinkled edges. This is very long lasting foliage with woody stem. Ferns – these make a lovely collar around bouquets. A number of varieties which all add movement to a design. Ruscus – this is either soft or hard. Soft ruscus is very floaty and often used in wedding bouquets. Hard ruscus is a staple in many gift bouquets. Both long stemmed. These foliages are all available from a floral wholesaler. They can also be bought from a florists’ shop but tend to be more expensive, and, because they are so often used high street florists are generally loathed to part with them unless they’ve got surplus stock in! Some major supermarkets are also beginning to sell bunches of foliage thanks to the increase in availability of foliage both home and abroad. Just like flowers, foliage needs to be cared for to ensure it stays in good condition for a long time. If you can get hold of it, always use mature foliage as both leaves and stems are more robust. Keep water topped up regularly before you use it.